I was expecting from google something game changing. A service that let me watch what I want, for a cheaper price than cable. A service that I wouldn’t have to scroll through channel I don’t want or pay for channels I never look at. What this is cable pay tv on a YouTube platform. App: the app is easy to use. But for how little I watch live tv it’s not really worth it. $50 seriously? And this service has no Viacom channels. You’re better off getting antenna and Philo. Bait and switch. 40% price increase in the time I have subscribed with no added value whatsoever — unless you count adding channels you don’t watch and never asked for. Just like the cable companies. YouTube TV is just an awesome service. Some are complaining about the new price hike, I still think it's worth it. Honestly, it's better than Directv, even if they were equally priced. I love the unlimited DVR, being able to easily watch live and recorded stuff anywhere I went on any device. It's just so easy to use and our family loves it. The guide could be better - it only shows you the current show you’re watching, and the upcoming show. Other than that, I can’t complain! Come on google, you can do better. What a terrible experience. In the meantime I try to sign into a channel app using my account, and it won’t let me authenticate. Definitely canceling especially with the price increase! Forcing customers to go from $35 a month to $50 is totally ridiculous. Why should I have to pay for channels that I didn’t ask for, nor will I watch? This is unacceptable. ~40% to add a few tertiary channels I didn’t ask for, don’t want and won’t watch? Was a good deal, but now feels like a rip-off. I first had YouTube TV when it was originally only $45 a month. My main complaint recently has been that they have increased the price for several channels that I don’t want in the first place. On top of that, I updated the app three days ago, and the streaming has been terrible. It glitches every five seconds. If they would fix the streaming, I would be okay with the price increase. However, if this crap streaming continues there’s no reason for me to being more more than I originally was. 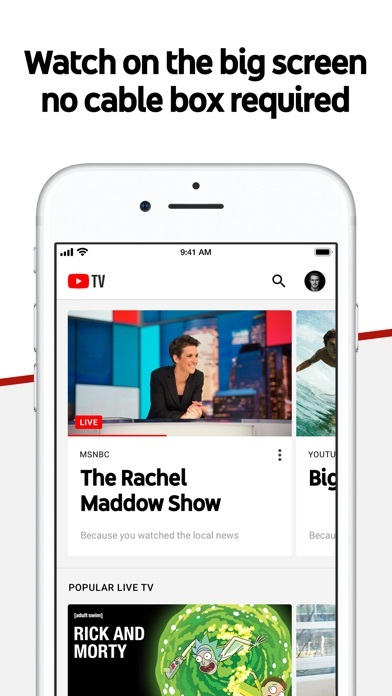 I have enjoyed the YouTube TV app for several months now. I have even recommended it to family and friends when inquiring about cord cutting. The app works well on my iPhone, my wife’s iPhone and all our Apple tvs. Loved being able to watch most (if not all) my local sports teams, and the fact I could do that anywhere was amazing. However, with the introduction of more channels, I can understand a price increase. What I can’t understand is why they wouldn’t have a tiered system. I don’t care about animal planet, or HGTV. I just want my sports and local tv. I guess that isn’t YouTube TV’s market. It’s time to find a new service, as I will be cancelling my auto pay for this next bill cycle. Half the price and much more user friendly. Highly recommend! The app works like a charm. No complaints about the operation or content. My hack is with the increased price a month after I subscribed. I cut the cable based on the price and quality of content and saved a few bucks over cable tv then right back to sq 1. Not nice y’all. 54.99???? For that price I’ll just go back to cable. Good bye! The recent increase in price is a money grab. If the folks running YouRube TV wanted to increase the price, they should have increased it on the customers who wanted the extra channels. Forcing everyone to pay the price increase for channels they don’t want is exactly why people left cable in the first place! This recent decision to increase the price on every single subscriber they have is going to force people to leave YouTube TV. When I subscribed to YouTube TV on May 17, 2018 the price was $40, not even a year later the price is $50. Had my doubts, but no more! Good golly PLEASE FIX THE APP! I cannot get through a 45 min show in less than 2 hours for having to close the app every 5 min. The sound will just stop and 3/4 of the way into any show and BAM- glitch! Another show will start playing or the show you are watching will start over. This has been an issue through many updates. I frequently use my iPhone to watch and it’s especially frustrating when you have a limited lunch break! We love the channel choices (5 stars on that) and are happy we made the change! That said, when you pay for service, you expect it at the very least to work (and on any device)! App is great. It is the behind the scenes to watch out for. Just st had 25% price increase for poor and rarely used added channels. They are starting to ruin a good thing. Even asked for information and got nothing. Again, the app is great. They management lacking sincere customer care. Just after more MONEY. A few discovery channels doesn’t cut it. Would love to see the weather channel mainly, but more channels needed if you’re gonna charge $120 more a year now. It’s a bummer I won’t be able to keep my $35 subscription plan. The sudden increase to $50 convinced me to cancel my subscription. I knew this app was to good to be true. I really hope you listen to your customers Google. Not please that I JUST subscribed to the service and it is going up 200 dollars a year, with no option whatsoever to remain at the current subscribed price. For that I can stay with cable. Won’t renew after April. The technology is good, the app works well. The problem is they have raised prices so much in the last year that it’s not a cord cutting option. And it counts against your data cap. Might as well stick with cable. Not worth the cost or the recent price hike to $50. I’ll begin exploring other offerings and progress since I last used them. Hate that the autorotate is always enabled. Unpredictable behavior when you click on another show while watching one show. Would like a hands off mode that only responds to gestures or long pressing home button. Oh well. was the best option out there. for $35/ month i could deal with the buffering, lack of PIP, no program guide. Not for $50. There are too many sports channels that I don't watch and now they added 10 more stations I don’t need. At the very least they should allow current subscribers to keep the packages they have. Goodbye youtubetv. you out priced yourself. It was better a few versions back but now when watching either pre-recorded or live TV it will intermittently start playing an earlier program on the same channel. Sometimes closing and restarting the apps helps but at some point it will start doing it again. Totally unusable I can’t watch a one hour program without this occurring. Way too many commercial 6???? The base price of $39.99 is going up for $54.00 according to and alert I got from the app. I am enjoying no cable but what is going on lately with this app on my Samsung TV, both of them. I have no issues at all with Netflix or Amazon. May have to move to Hulu! The only thing I dont like is when traveling the live feed switches to whatever the local programming is. For example while out of town in California I couldn’t get the Chiefs game etc. I’ve tried several other streaming apps and YTTV is best. It’s down less and user interface is slightly better. A low bar. Now they want to jack up the price and claim the few new channels are worth the increase. Not so. Love Youtube tv! Best thing we ever did. Wish we would have cut cable a long time ago. Great app. Recent increase of forty percent to the price of the service for some garbage channels that I don’t want brings me to the end of this road however. Hoping an alternative steps up soon. 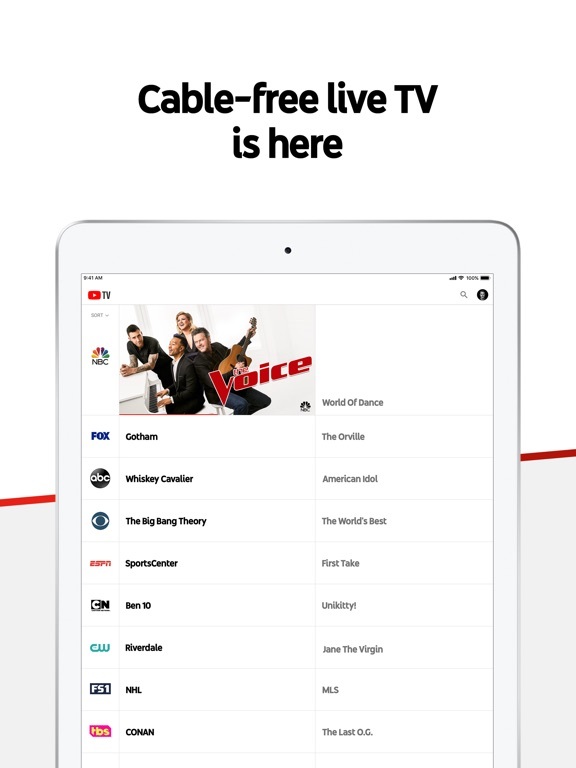 YouTube tv has now become a cable company. Raising their prices for channels you don’t want. Their whole existence was for cutting the cord. Now, we will have to cut YouTube tv. Such a shame. Buyer beware. YoutubeTV just increased the price 15/month for all customers while adding 8 channels nobody cares about. I did not have a choice to pay more for these additional channels. At 50/month I might as well switch back to cable. Unless SlingTV or HuluTV has better options. I cut cable to join YouTube tv. The product and streaming was great. The channel offer, while not all encompassing, had been just what I was looking for. Then YTTV decided to become a cable company, forcing a bundle of channels onto me that I didn’t ask for or want for an extra $15 a month. Why? I’m not sure, but I know the effect. I have canceled my subscription and won’t be coming back till they remove these channels or offer tiers. Bad decision, YouTube TV. 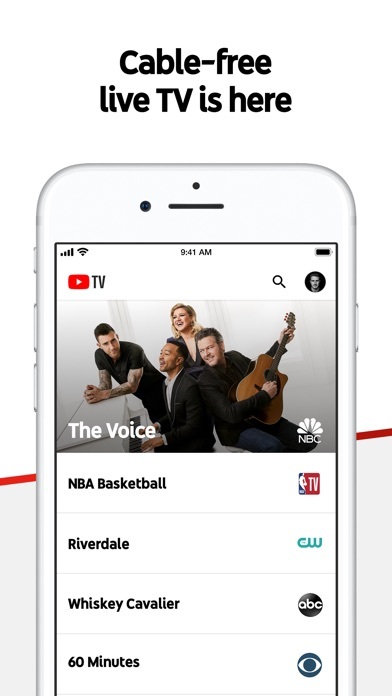 $15 more a month — and now YouTubeTV can’t reliably play a live stream? The app consistently jumps from Live playback to content from 1-5 hours old with no warning. This happens repeatedly in CNBC and suddenly I’m not watching live Financials but overnight data ? Total bait and switch. In a year has gone from 34.99 to 49.99. It’s too expensive. I signed up for YouTube TV two months ago. I’ve liked the service—even with a few technical glitches occasionally causing viewing problems. But I just got notified that the price is going up 43% next month to $55. I’ll be canceling my service as YouTube TV is no longer price competitive. I didn’t cut the cord to sign up for another monolithic package of channels that I’ll never watch and constant price increases. I’d rather not have classic TV at all. Sometimes even when the buffer is healthy the video does not stream at max resolution on Apple 4k TV. No have to quit the app and get back in to fix. No dvr compensation for live sporting events starting early or running long. This came with absolutely no warning and channels added that I could care less about. I am NOT happy and want to cancel. As an early adopter of the technology I went through the ups and downs with YouTube and google . Happily paid $35.00 a month for a service that would go down for big events (World Cup) or just not work. They are now adding a couple of networks I do not care for and increasing my bill by 42% with no option to opt out. Transferring my business to Hulu + Hulu Live at least for the price increase they will give me Hulu, a better UI, and allow me to fast forward through recordings .. YouTube tv will force ads to paying customers on some recorded shows.. Also, gave YouTube the chance to respond to a couple of issues but the only response has been a price increase. The new price change will have everyone leaving ASAP. Charging 15 dollars a month for channels nobody would ever want and not responding to any contact via email or social media DMs is awful customer care. Hulu now far more appealing. Charging cable prices for an app that needs great WiFi and offers far less. Very very silly indeed. I like the amount of channels, the amount of accounts that your family (or friends) have access to their own shows and recordings, Xbox, Roku and Chromecast YouTube TV app work awesome with the app. And the ability to watch on your laptop is awesome. From being on over the air TV for years, this is an awesome"Cable" experience for way less than what Cable costs. Now I wish there could be a 4K option on the website or on the Xbox one for Xbox one X. Update. 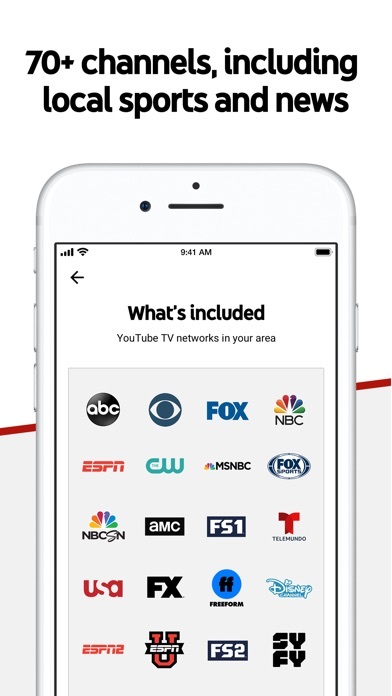 New price changed added new networks but I might cancel YouTube TV if it goes any higher. Especially since I have an apple device I'm getting discriminated from everyone else and having to pay 5 bucks more. (40-54 bucks) add more users or something. I was hoping this app would suffice to replace my standard cable television, but unfortunately, I can’t watch an entire episode of anything without a video-killing bug ruining the whole thing. Specifically, about 3/4 of the way through a television series episode, the video glitches and odd things begin to happen: the audio track jumps to the beginning of the episode, the video freezes for a moment and then continues to play under the audio from the beginning. And then the advertisements! Oh goodness! For $50/month, I would expect fewer ads, but there they are every 10 minutes: 2 to 3 ads at a time. And guess what? When you have to close and re-open the app to find your place in the episode you were watching, EVERY. SINGLE. TIME. You try to track through to the spot where you left off. The episode starts to play, and then a series of ads immediately kicks in. Missed your spot? More ads. It is infuriating and app breaking. I am using a first-generation iPad Pro, for what it’s worth. It’s honestly the best tv product I have purchased, I’ve been a member for about a yr. However, there are a few things I would love to see added: 1. When browsing through all the movies / series, you can not tell which movies or series you have already added to your library. After selecting the title, it will than show you have already added this to your library, rather than scrolling and selecting only what you need. 2. When you view what is being recorded or upcoming, it appears to be recording new episodes AND episodes I have already saved under my library. I wasn’t sure if this was a glitch, but it prevents a member from seeing what would be new and upcoming, rather than something that is already saved. Plus it only allows you to see 50, half of which you have already recorded and saved to your library. Love it and won’t look back. I have had YouTubeTV now for about 5 months and wish I would have made the change a long time ago. So happy to cut the cable and the outrageous monthly cost. I read some of these bad reviews and I don’t understand why people are having issues. I went out and purchased a few Roku’s for my tv’s and had them set up in less than 10 minutes. Now if I want to watch on my TV I just turn it on with my Roku remote and then click YouTubeTV and it connects right away and I don’t have to stream from my phone. I have found that most times I just lay in bed and watch my shows either live or from my library on my phone or IPad. I have yet to have any issues at all. I also love being able to be out and about and not miss any baseball or football games. Highly recommend this. Keep up the good work YouTubeTV. Better than expected. Some UX problems. I’ll start with the problems. When watching a show in full screen on an iPad, trying to multitask (by swiping up from the bottom of the screen to reveal the dock) more often than not causes the show to jump to a different point. This happens because the timeline at the bottom of the screen is too close to the bottom of the screen, so any touch near the bottom of the screen triggers a jump to that point in the timeline, even if you’re only trying to reveal the app dock. It took several occurrences of this until I figured out my my basketball game was rewinding 30 minutes. Please fix this issue, add some padding beneath the red timeline bar when in full screen. Other con: Sometimes the picture is blurry for no apparent reason. It usually sharpens after 3 minutes or so. You need more frequent bandwidth checks in the app. Netflix does a nice job of this for example. Now for the pros: It’s nice knowing that my games, shows, etc are being automatically recorded and I can start watching them from any device at any time. Often times I’ll start watching a basketball game 30 minutes after it starts. I like that I can start watching the game from the beginning even while it’s airing live. The recording suggestions are also helpful too. When I finally said goodbye to cable, it was so liberating! I started using YouTubeTV shortly after it came out, did the trial thing and was hooked. At that time it was $35 a month, and still is for us early users. As a sports fan, there are plenty of channels to choose from, and when they added MLBtv and NBAtv (at no extra charge) I felt like I had won the lottery! The overall channel selection is good, I don’t watch a lot of television, but when I do I can usually find something on in real time, you can even record shows and watch them at a more convenient time. I’d give it 5 stars if YouTubeTV carried HGTV, that’s the only thing I miss from having cable. Very rarely have I experienced any technical issues, far less actually than I had with cable. So as for me, I’ve been very happy with YouTubeTV and will have cable never again! PROS: you get your local channels, the staple channels such as ABC CBS NBC FOX etc. and a variety of sports channels. CONS: we have experienced CONSTANT problems despite the fact that we have high speed internet such as not being able to change channels because it will change on the phone but not on the TV and then no longer pulls up the TV to cast to so we are left to uninstall & reinstall the app EVERY time and programs not playing just to name a couple. Also not a very wide variety of channels to choose from. While you have options to choose from for sports, there's a deficiency to offer popular alternatives like possibly HGTV, GSN, Lifetime, Hallmark or any type of cooking channels. So when comparing pricing and channels offered with dish networks, it's really not worth the trouble to pay the same or comparable for less channels and less conveniences so I'm glad a free trial was offered to know what the service would be like before buying, although I've heard canceling is just as difficult. Needs work When you hide channels that you don’t want to see but every now and then, you have to add them back to your list to watch them. Then I have to remove them again just so I can only see my regular channels that I use daily. Need a list of “your list” and a “view all”. Would also like to be able to set where I want it to open to. I’d like to set it to open Live TV because that’s what I use the most. But I have to wait for it to load then I have to change it to Live and wait again. Would also like to be able to view the evening lineup by swiping down the timeline. It’s 6pm but I just want to see what’s on at 9. I have to leave my view and go to the channel. I should just be able to swipe down to 9. If I like it set a reminder to come back and watch at 9. I want to be able to see all channels at once at 9, not click each individual channel to see 9. Thanks! I’m a one subscriber and not sure how long I will be. But I haven’t had Home cable or Internet for five years now, it’s just to expensive to pay for something that keeps you trapped in your home. Think about it folks, these cable companies are making you pay to stay home. To me that’s a rip-off. I’ve seen many things disappear from our lives, wire phone, vinyl records, 8 track, VCR’s, development of pictures.. to mention s few. Sorry to tell you folks but cable is pase. I’m sure their will be a lot of cleanup work to make the app work flawlessly with all platforms but I think plugging in your cellphone to your TV is awesome!! I just hope they don’t get too greedy. I still have a lot learn about it before I decide to continue, and see if I still have TV when it’s stormy an of course money is always the deciding factor. Love it! Get rid of cable!!! First off, cutting cable was a great decision! Thank you for airing all my sports! That was the only thing holding me back from cutting the cord a while ago! Awesome sauce! Okay now that I got that out of the way, here’s the details. The iPhone app is great. It works great on WiFi and pretty good on cellular as long as I have good service at the time. Now the Apple TV app is horrible...that’s why I give this four stars. I have to screen share from my phone to the Apple TV as the TV just sits with the circular loading screen. And when it does decide to display, it is a horrible picture. Please really look into the Apple TV app. I know the most recent gen runs 4K and if you’re looking for a easy way to tell us you need to charge extra to see in 4K like Netflix, just tell us. Please figure out the Apple TV app sooner than later. The service and the associated AppleTV app have been the perfect replacement for my FIOS TV service here in New York. I’m giving it five stars simply because I’m so happy with the change— but there is room for improvement: 1. There should be the ability to hide channels you don’t EVER watch, or vice versa, being able to mark channels as Favorites, be able to scroll through only those. Currently in the Live guide, I have to scroll through endless specialized sports channels in order to get to the channels of personal interest to me. 2. The organization of the “Home” and “Library” tabs could be a little more intuitive. Once a show is watched, it should disappear from the “New recordings” list. I also feel like “New recordings” should also group themselves into per-show folders. 3. I find the behavior of the AppleTV remote to be a quite jumpy, especially when going left and right in between Library, Home, Live, and Search. 4. Please support single sign-on on the AppleTV to make using per-channel apps easier! The endless logins are tiresome. Can’t wait for some refinement to the UI, but overall still extremely happy with the apps and with the service! I definitely love this app, I think it’s a better option than cable and much less expensive. The only improvement I’d like to see is a better way to skip forward while watching longer programs on the Apple TV platform. The issue is there’s no 15 second fast forward while watching shows using the Apple TV remote and this happens to be a problem because if you are trying to slide your finger forward during commercials you tend to over shoot your mark quite easily. I’ve noticed when I’m using other programs, such as Netflix, the Apple TV remote has a 15 second fast forward option by simply placing your finger at the bottom right or bottom left part of the trackpad on the remote. Other than that it’s a great way to watch TV and I wouldn’t recommend it. I was super excited to download this free trial to watch the World Series. I think this has super great potential. However… In order to watch a show on your TV, you have to screen share from your Apple device. So that means… First, that anytime you want to use Siri to talk to text, your show will end. Next, every time I try to watch a show on-demand and it gets to commercials, it automatically crashes. That makes me have to completely close the app and restart it. Very annoying. Last, if I’m trying to browse the web while I’m watching a show, certain sites will make the show crash as well. I tend to multitask a lot while watching TV, so these are relevant problems for me. If you can handle watching TV without being on your phone and letting your phone do its thing while it broadcasts a show, you should have no issues. The most feature and content rich service available for the money. Hands down. My roommates and I all share access to the service and each person (+ significant others) are added as "family" members. Everyone has their own log in and ability to record shows without conflict. It's amazing. That's $35 divided by 6 people who all have their own set up! I have a Chromecast and a Google Home Mini set up, which is useful for controlling the TV. If I know what I want to watch, I can tell the Google Mini the show, movie, or channel to throw on. I can also tell it to pause, rewind, or fast forward. What I'm trying to say is that I've tried other services and nothing even remotely competee from my perspective. I am sorry that I won’t be returning as a customer. While I did actually really like the service provided (when I actually got the service) I think you need a better system in place for people that move. I think it is not worth the headache that I have gotten when not once, but twice I have to request a refund due to home area restrictions that cannot be resolved without unsubscribing and going back and resubscribing. Then when you resubscribe and download the app, you get the same error message about limited access (which actually means no access) and have to do the whole refund process over again. This is something that you guys should look into in the future. I’m just one subscription lost due to this. Not a big deal for you. But it’s a big deal to me just because of my time and effort wasted alone. Hope this doesn’t start happening to more people and you start losing more subscribers! The service is great-streams really well. I love the On Demand feature as well. The interface is easy to navigate and find what you’re looking for. A couple improvements I would make to the iPad are: - slowness to close out of a show. Clicking the minimize icons takes a 3-5 seconds and the clicking the exit icon (or swiping the show down to the corner to close it out also takes another 3-5 seconds) - the progress bar along the bottom to fast forward and go back is not placed well on the iPad - if you try to use the ‘swipe up’ iPad iOS feature to get to the brightness bar to lower the brightness, it always hits the show progress bar and you lose your spot in the show. When watching recorded shows from the library you cannot fast forward through commercials. Even if you want to skip to the middle of the show. You can fast forward through the show to the next set of commercials. Then the fast forward buttons disappear and you have to watch sometimes as many as seven commercials. Just to make matters worse there is a timer that shows the remaining length of the current commercial and how many commercials follow before you can watch your program or continue to fast forward again. Just waisted 25 minutes trying to watch AGT. App would play 7 commercials then freeze when trying to load programming. Each time tried playing again it would play commercials just fine and freeze at the end of commercials. It’s a horrible app unless you find value in paying to watch commercials. Seeking other apps now. 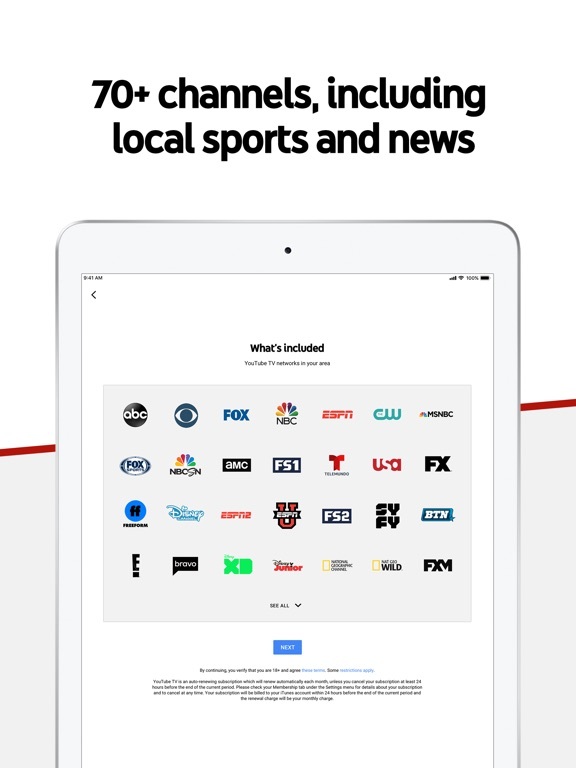 I’ve been using this app after having been a longtime DirecTv subscriber and although there are a few drawbacks, I am overall happy and will not be switching back. Channel selection is good, casting works great, and the ability to record shows and take them on the go is perfect. One of the best things is being able to have so many users on one account and being able to cast on multiple devices/tv’s for the price, unlike other streaming competitors. Now there are a few quirks that could still be ironed out to make it a little more user friendly but as you use the app you learn how to work around them and I imagine the developers are figuring that out as well. I love not paying an extra $120 a month for tv! I had Sling TV for a few months and not only is this $10 cheaper, but I had to pay an extra $5 per month with Sling to only get 50 hours, which seemed like quite a bit, but I quickly realized just how little that actually is and also, with it being an online thing, it doesn’t really make much sense to have so little space. With this, I don’t have to worry about that. Pretty much the only problem though is I wish it had Nickelodeon channels like regular Nick, Nicktoons, Teen Nick, and Nick Jr for when my cousins are over, and my mom would switch over to this if they had HGTV, but since that’s the main thing she watches, it makes complete sense that she wouldn’t want it. I love the selection of channels and video quality, but the app (especially on the Apple TV) is nearly unusable. Has anyone over at Google actually used this app for more than 5 minutes on an Apple TV? I highly doubt it. Either that or some managerial type forced it to be released before it was done. It’s so bad it makes me wonder, “did they assign the creation of this app to an intern!? !” It frequently gets itself into a state where the directional controls completely stop working. Basic things like swiping using the Apple TV remote app frequently scrolls the wrong direction. Killing and restarting the app sometimes helps but not always. In general it’s frequently unresponsive for no apparent reason. This is the only app I use regularly on the Apple TV that has these kinds of issues. Please fix this or I’ll be canceling the service. Overall, a fantastic service and channel availability, if YTTV meets your channel needs. However, one major flaw in the app that I’m shocked still isn’t available - you cannot easily scroll the ‘guide’ ahead to see what’s coming on later, for more than one channel at a time. You have to pick the specific network, then view upcoming airings, but can’t do this at the level of being able to see more than one channel into the future. This CAN be done on Apple TV, but not iPhone (somewhat understandable, but other streaming services manage this just fine), NOR IPAD (not understandable with all the real estate...they do however give you two airings (currently live and next), but no more). Please add, and the app will be up to speed with what you’d expect from a TV service. Overall, my family enjoys this app. We get a better picture casting local stations than we do using our digital antenna, and we like having a library of our favorite shows. However, the functionality and access need to improve for this service to truly distinguish itself. The Chromecast and our phones (iPhone 7s) often “lose” each other and we can’t pause or otherwise control what is streaming. The app in general is cranky and often freezes or quits. Also, major stations (including the CW) cannot be streamed/recorded live in my market (a metro area of two million people). It’s frankly not fair that other areas get more stations/service for the price. This would be a five-star app with some bug fixes and better channel availability. It’s had an occasional hiccup, but usually it is resolved by resetting our Apple TV. I think it’s more of a device issue than an issue with the app. There have been virtually zero issues with quality or any buffering, and I’d venture a guess that people having issues with streaming has more to do with their ISP’s. We had streaming issues due to our last internet provider throttling (our supposedly 500 mb/s download and upload,) but since switching to another ISP it has worked flawlessly. 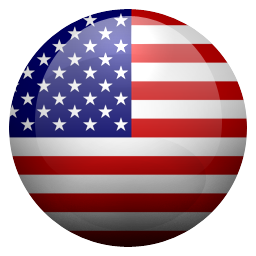 My advice to those with issues, try steaming with a VPN to see if the issue is the app or your service provider. Excellent App! Video quality can be better. Overall, I enjoy this app. I’ve recently deleted my DirectTV app and my NBA LEAGUE PASS app because YouTubeTV has improved its video playback quality. This app has all the channels I watch, as well as it’s very organized and intuitive. I’m able to quickly navigate to my favorite shows in a matter of seconds. I also love the fact that YouTubeTV automatically record the shows for you. The only improvement I-so-eagerly request is the continuous effort to make video quality better on sport programs. Sports as in soccer, basketball, football etc is very fast and so they’re often glitches and hesitations trying to keep up with the fast speed. Once they’re able to fix this problem - it will have no competitors (especially for sport fans). My review echoes that of other users. The app disconnects from my Chromecast often. This almost always happens when I either lock my iPhone and I unlock my phone, or when I switch between another app or go to my home screen. This seems to be a similar problem with other apps like Netflix, but they seem to handle it better. It seems to me Google should be able to fix this behavior as they should be experts in implementing their own API, or they should prioritize this bug higher in their backlog if they already know about it. I would also like a way to turn off live previews of channels. Sports scores have been spoiled a couple of times for programs that were in the process of recording that I was intending to watch from the beginning. Got rid of cable have had this for almost a year. It’s nice because it gives you the option to watch most shows on demand but it’s stepping back in time with all the ads. Some shows you can fast forward - although that feature is horrible - however the new shows you’re stuck watching ads. It’s not ending up to be that much less than cable or dish with the upgraded internet so for the money....I wish it was a tad more sophisticated. I feel like I stepped down - down in price and also down in quality from cable/dish. That said...I probably won’t go back to cable or dish...I’ll just keep hoping this gets better and the price doesn’t go up. If the price were to increase on here I’d be calling back direct TV the next day. I love this app, I can get most of the shows that I paid nearly 3 times as much to watch with satellite or cable providers. I take my IPad just about everywhere with me and have no problem using the app/service. Yes sometimes I have to restart the app because a commercial will lock up during playback of a program, not a big deal at all though. I can get right back to where I left off. I saw a comment that it was difficult to cancel and someone was being “held hostage” now. This just tells me that they don’t know how to use their apple account. It’s very easy to cancel if you should want to. With this service WHY would you want to? Freezes, forgets, fails. Total waste of money. 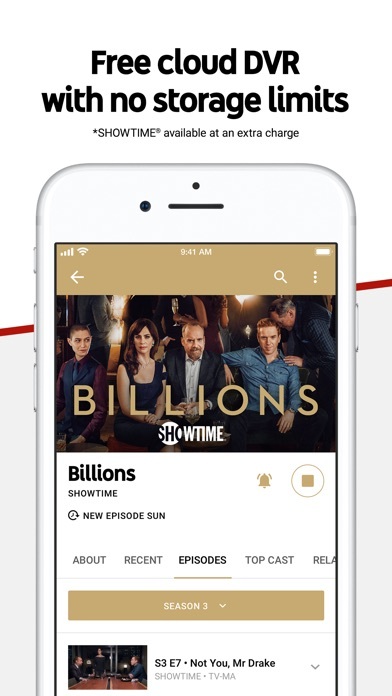 App often freezes up, constantly forgets where a show is paused, and crashes just often enough to make google more money from ads embedded in shows. Borders on being a scam. Support is like talking to a room full of deaf crickets, they don’t listen but constantly chirp the cut-and-paste party line. 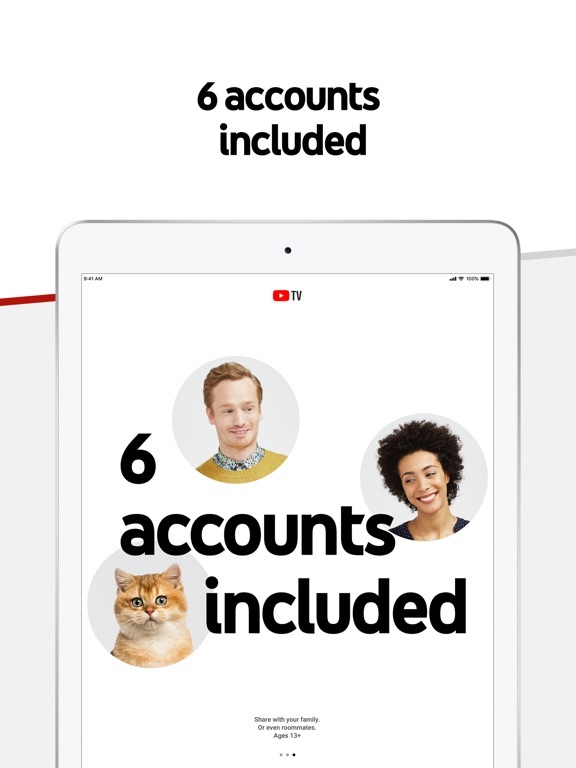 Been with YouTubeTV six months, half has been free from credits given because of service failures, app crashes, etc. It’s just not worth it, I’m leaving once last month of free credits ends. Also, they lied to me, said I could share account with family, but since I use a Google account for my email, they won’t let me. Same price as everyone else, but they won’t give me the biggest feature that I came to them to use. Total rip-off. Read the fine print before they rob you of basic features. Dumping this at end of month. My family and I made the switch from Fios to YouTubeTV. For the most part we are very happy with the switch. Loved cutting our bill to just internet, and paying $35 for YouTubeTV. The four of us each have our own libraries that we are able to access on the go. The channel choices are limited, but I expect that to change as more people use it. The only thing that I find to be a negative is the connectivity of the remote on the app. It loses connection quite quickly easily. There is no way of knowing when it’s lost connection until you try to use it to pause or rewind your program. If this issue and more channels were added, it would definitely be a five star app. i started use the app back when it was launched i used for a few month then i quit because of the more and more commercials, they were really annoying since if u watch something on your phone u cant check instagram, twitter or whatever during the ads /on tv ads are more acceptable i think. well now i have the app again and i think they realized this issue i feel it has much less commercial! so now i will renew my subscription montly, I am also waiting for more big channels like TLC or MTV but overall This is the future of the TV. i really dont think people gonna pay and watch cables in the future. I am gonna give 4 stars now and upgrade to 5 when they launch more channels. We have have found it a good trade off from traditional cable tv but it has its quirks. There are often connection issues between our iPad and the tv, the show plays on but you cannot control it. Shutting down the app and reopening it usually fixes the issue but it’s an annoying quirk. You cannot look ahead on the show schedule - it’s a fixed 2-hour window, another annoying quirk. The search for shows is nice but it does not always find all the listings it should (ex. State of the Union address only showed one network when they all had coverage). It’s not perfect but it works and it is a better value to us than cable tv. Hands down best cord cutting service. The app itself is very solid, I have had no problems streaming on WiFi or cell data. Far and away the best option to replace cable tv, imo. More service related than the app, I am a bit worried as google seems to continually add channels that I can’t imagine many ppl want... and then raise the price. This was what was wrong with cable tv. I don’t want 100 channels for $60 a month and of the 100 I might watch 8 of them. I want 30 for $25, even if I only watch 5 of them. This service started at $35, they have since added a bunch of channels and is now $40. I won’t stick around the next time they raise prices. As is, with having to pay for high speed home internet I am not saving any money from before. The worst part is casting to a TV, but that has as much to do with the device your casting to... chromecast, Roku, etc. I simply never do it anymore. 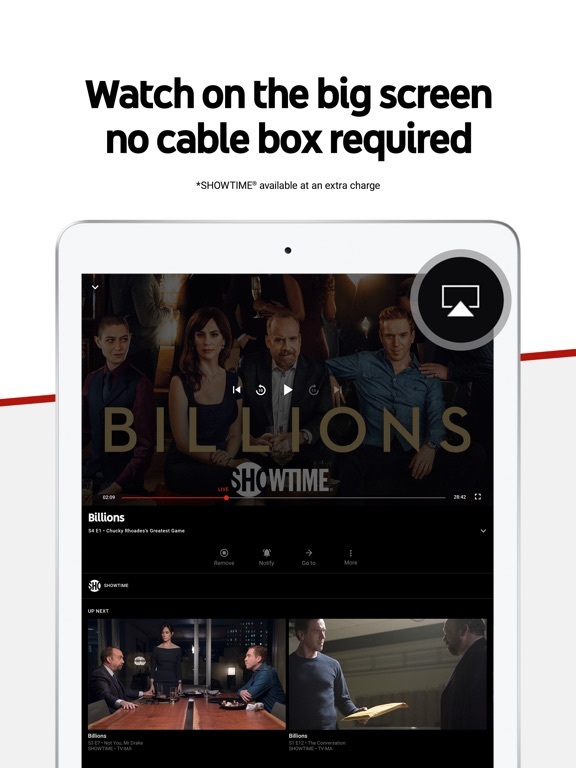 Most devices have YouTubeTV as a native app now anyway, very little reason to ever cast in my experience. Overall, deff recommend. I would give this five stars, EXCEPT for three big issues that each deduct a star in my book: 1-On live TV, there's no easy way to see what's up next. If it's 4:58 the app does not show what's up at 5:00 on the channel line up, you have to wait until 5:00. 2-Ads. When watching recorded shoes in my library, I cannot FF, I must sit thru several ads, even though I'm paying for this service. 3-Clunky navigation. For instance, I hit the 15-sec rewind to hear a line I missed, and the app started a new set of commercials. Or sometimes I attempt to go forward or back 15-secs, but because the controls are so tight it selects the"next show" function and I have to go through a whole chain of laborious steps to finally get back where I was. Correct these three and you'll get your five-stars. While I do enjoy the live tv aspects of this app and the channel selection, there seems to be a glitch which will restart a movie or program that’s not live towards the end of whatever you are watching. I just spent an hour and a half watching a movie and never got to see the last 10 minutes of it because it restarted at the beginning and you can’t go back to the ending! Please help because this makes watching anything else other than live tv on this app rather pointless. UPDATE: As of the last 2 days all of a sudden nothing will play off the app on my iPad. The buffering wheel just keeps spinning. I’ve tried resetting everything and it still doesn’t work. I’ve had this lovely service for at least six months. My family and I enjoyed it and never had any issues. Within a months time my husband, son and father in law couldn’t log in. I contacted the ONLY department they could help and they gave me password reset info????? The app kept asking showing them the “Already a member” page and my poor father in law made the mistake of charging it on his account(I’m sure that’s what the developers want). Then it finally happened to me, now I’m kicked out of the app. I’ve tried to cancel the subscription,, renew the subscription, add my family group, delete the family group. And now I’m receiving an error message. There’s still NO HELP AVAILABLE. Oh, unless you need your password reset....which I don’t. I’m not sure if the app crashed but I’m very unhappy. Finally, you have implemented full screen support for the iPhone X. The timing is suspicious since Apple had their big show yesterday to introduce the latest iPhone Xs and Xs Max. I’ve been harping on this since November last year and it finally is a blessing that you finally added this feature. So Thank you so much! Now to get 5 stars, I was hoping you can add a button or shortcut so that I can channel “back n forth” or “flip back in forth” between 2 channels quickly. Currently while using app I do not see a quick way of flipping between 2 channels. This would come in very handy when watching two live sports events at the same time. Thank you again. I’ve given this app 4 out of 5 stars. What I love is how simple and affordable this option is. I’d prefer it over cable and satellite for a couple of reasons. One reason being cost. I appreciate the fact that I only spend $35 on my television subscription and are able to watch all of my local channels, tons of sports channels and a handful of movie channels. I LOVE IT!!! One subscription covers every tv in our home. My past tv service apart from this app would cost upwards to $100 for 3 rooms. Ridiculous. The reason that I gave 4 stars and not 5 is simple because I wish there were more movie channel stations. Otherwise it’s still a very awesome service and the cost is perfection. Generally, very happy with Google services, but this one is terrible. First, I was asked if I wanted a free trial, then I was automatically subscribed and charged $40, which I didn't realize until I saw an email confirmation that I had signed up for a recurring subscription. Then, when I tried to use the service to watch LAFC, the team that wears YouTubeTV on their shirt and of which I am a season ticket holder, I was told that the match was not available because I am currently in SF. When I reached out to customer service for an explanation, the response that I got was that there was nothing that they could do about the match that had just started, but that I should change my local area once I returned to LA and then I would have the OPTION of recording the match next time I was out of town. I go to matches when I'm in town, so why would I need this subscription if I can't use it outside of the Los Angeles market area. Now, iTunes is telling me that this subscription is not eligible for a refund, even though it was A) not clear that I was committing to pay $40 B) to watch a match that was never going to be available and C) cancelled my subscription as soon as I found out that I had been charged. Thanks for stealing my money. For $39 a month I couldn’t log into my account to watch on my iPad no matter how hard I tried. There seems to be a software issue. Also, without notice after the trial period ended, I was charged for another month. I immediately tried calling YouTube’s office to try to get it cancelled, but the office was closed over the long Christmas holiday weekend. I called on the first day they were to be open, but still got the voicemail that they get were closed over the holiday. This went on for days. So, nobody was ever available. You also cannot unsubscribe on the app, so you have to research that. I deleted the app. Way too expensive and without being able to watch on my iPad, pointless. I tired, but found the app to be a frustrating waste of my time and $$. Wish I could get my money back. The fast forward & reverse controls in this app are absolutely terrible, which makes it extremely difficult to deal with commercials & app bugs. There’s no TV/channel guide, and the navigation to find what you’re looking for is mediocre. Further, the app still has a terrible bug, where... when your mobile device is at rest (i.e. when your screen is black) and then it’s reconnected to an in progress Chromecast, it sometimes won’t reconnect to the current point in time, but instead, to the beginning of the show that you’re watching. Coming back to my first point, with the terrible fast forward & reverse controls, it’s a royal PITA to get back to the correct point in time for the show that was previously in progress. Love being able to record sports. Love being able to record LOTS and not running out of space. Quality is good, if you have good wifi connection. That all being said, software can find many ways to get to a black screen of “something went wrong, try again”. Also, ability to “schedule” recordings is kindergarten level logic at best. Multiple times something that “scheduled” didn’t record. Doesn’t handle multiple access point homes well. Lots and lots of other issues and while tech support seems to want to try and help you — they will conclude that they have solved your (THEIR) problem, sometimes when they really haven’t. I love YT TV. It delivers 90% of everything I want in television. PROS: - cheap - wide variety - programmable - multiple users - LOTS OF SPORTS CONS: - at times programmed sports are overshadowed when a different sport runs longer than expected. I get this a lot with My American Soccer/European Football. A baseball game post game runs long and I don’t get to see the first 30 min of my match. - missing 3 channels I love...History, Discovery, HGTV. 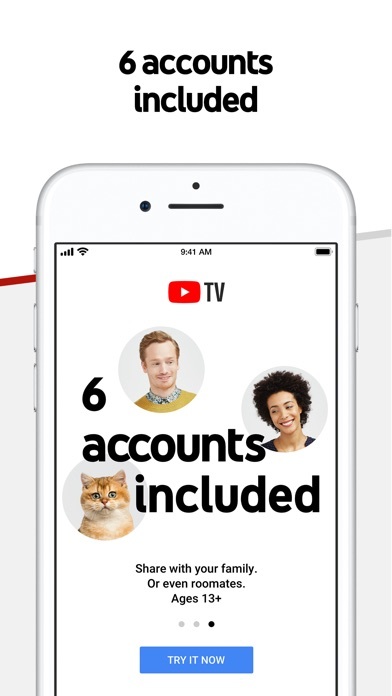 If YT TV had these...5 stars. - Can only record programs so far in advance. I might see a commercial for a movie/show/event a month before it airs...but I can’t select that to be recorded until much closer to air date. I usually forget and miss the initial air. Would be better if I could set recordings further out in advance. For me the CONS don’t outweigh the PROS. I regularly recommend YT TV to everyone who asks me, “How are you watching that?” With everything in life, it’s not perfect, but at least I’m not paying $$$ for Direct/Dish...getting 400+ channels I don’t watch...and still having to pay extra for sports. 10/10 would recommend! I have had this for a couple days now so far I liked it mostly for options it provides (multiple sign in and unlimitted recording... now with this app, I can find and watch and/or scheduel recording my fav. Sports a more than ever) I am still learning and ain’t wanna get ahead of myself, however the biggest weakness that I can mention (compared to other providers that I tried) is the low sound quality and image less than expected resolution. Well this will be important only when you watch it on a big screen tv and use a hometheatre settup. It is also a bit pricy, but all things considered, My vote will go to this app than others. I cannot interact with my account with an iOS device. When attempting to manage my membership on internet explorer i get a message that states to open with firefox or google chrome. I tried opening chrome on my iPad and there is no way to manage it there either. I have to use a windows machine running a chrome we browser to make any changes. The inability to manage my membership with an iOS device really put a damper on the entire experience. Non sure how this can be changed but even on a chrome web browser on an iOS device will not work. Please advise. Do i really need to keep my windows machine? We’ve been using YouTubeTV for about 5 months now and I’m convinced that this is what TV should look like. It seems to get better with each release. Just like cable there are a lot of things that I’d never watch and some that I wish I had. I’d love to have the Viacom programs (HGTV, Discovery, Food, etc). HBO would be nice but all of these are a cost vs value decision. One area that needs to be addressed is navigating through programs, the UI is not intuitive. I’d like to be able to skip over commercials and have a good way to navigate within the program. Still it has allowed me to cut the cord while keeping my wife happy. Overall a victory. 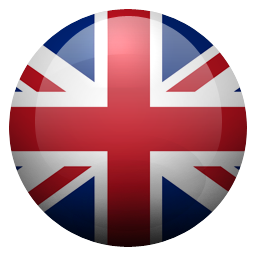 Enjoy using this app. It’s my only tv provider. 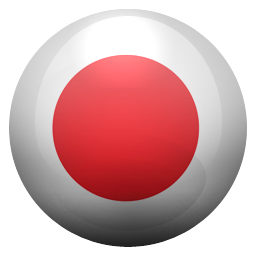 Allows me to record shows, start the show from where it is live (if I started watching late) or watch from the beginning, prioritize my channels in a list, start from the where I stopped watching the show, when I switch from my phone to my tablet and some other features. My only gripe is the channel selection. None of the Discovery Network channels are available. No Comedy Central. No A&E. None of the Nickelodeon channels. None of the History Channels. Maybe they are available in other areas but definitely not in mine. I requested the channels a few months ago but nothing has changed. That’s a drawback but otherwise, great app. We are immensely pleased with YouTubeTV...I only regret we didn’t get it earlier. We’ve had it for over a month now and it is so much better than we expected. We live in a rural area, only have ADSL...not high speed. It has worked faultlessly for us...no downtime, no issues. We love the ability to start a program at the beginning if we start watching it late and being able to record shows to watch later. We also love being able to watch on our iPad or laptop if we aren’t able to be near the TV. It’s everything we wanted and more. Thank you to the developers! Overall, the experience is great. My area for improvement is recording long length programs. For me it is 8-10hr long Tennis Channel programs. I need to be able to go to the beginning of the recording while the program is still recording. In every situation that this occurs, the first few hours get clipped and I can’t watch the entire program from the beginning until a day after the program airs, at which the programming has gotten stale, since it is live sports coverage. I’ve made multiple requests that this be fixed. Customer support is good at contacting me, but they have not yet fixed the problem.